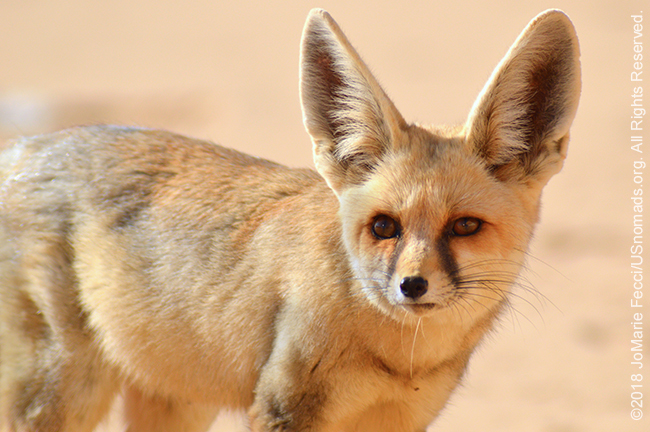 WESTERN DESERT, EGYPT (1 April 2018) — The fennec, a desert fox specific to the Sahara, first showed up in the late afternoon yesterday while it was still light. This in itself was strange, as it is typically a nocturnal animal that shies away from people. And she was shy. Even my early attempts at photographing her made her run off back into the rocky hills beyond our campsite. But she kept coming back. And when it got dark, she was joined by a second fox, scurrying around the outskirts of our camp. It was the first time I have ever seen a desert fox, though I have seen their tracks often in the morning sand. I felt very fortunate to have gotten to see one at all. 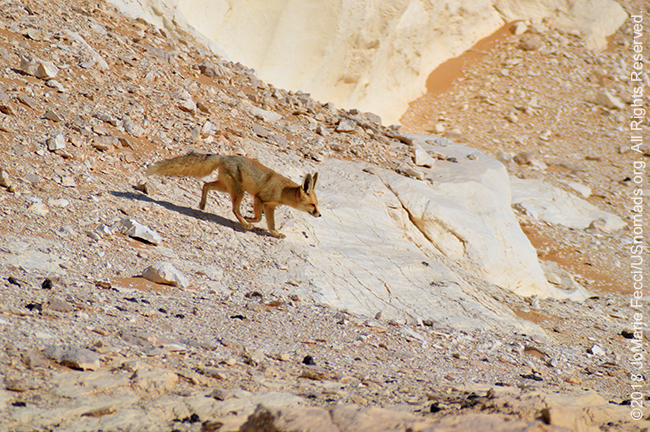 I felt “blessed” by the gods of the desert when I got to spend some time observing the fox again in the morning. I was up really early and Abdou and Ahmed were still asleep, so I quietly went off to explore a bit further around the valley. I was fascinated by some spots where the black and white sand seemed to “meet” and didn’t notice her at first, but the fennec almost crossed right in front of me. The light was good and I had my cameras so I thought I would try to photograph her again. I did a few shots of her from a distance and then slowly approached. She ran. Then she came back warily. Close enough for some photos with the long telephoto lens. I alternated between photographing her and just watching her, until I saw her go off to the hills across the way. I lost sight of her as she was the same color as the hills and sand. Then I saw motion and used the camera lens like “binoculars” to see more clearly. She was there on the hills near a rock, and a second fennec was sitting nearby. Then she went under a rock and came out followed by two little fennecs! The seated one must have been her mate. The little ones played a bit then she guided them back to their nest under the rock before coming back to my side of the valley. When I got back to camp the guys were awake and I excitedly told them about the fennec family. I wondered out loud how the small animals survived here without any water and not even any plant life. I saw no other animal tracks. 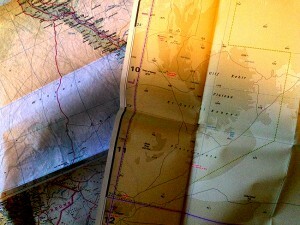 Abdou replied that there is water in another place not so far away, and that the fennecs can go quite a distance.